Preheat the oven to 375°F. In a large bowl, add the cream of chicken soup, cream of mushroom soup and softened cream cheese. Mix until thoroughly combined. 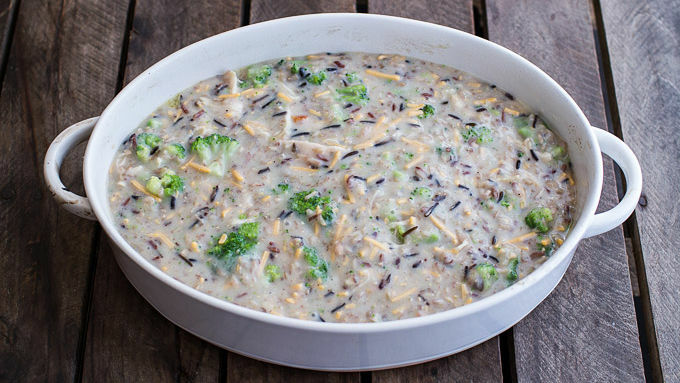 Fold in the broccoli, cheddar cheese, wild rice, chicken and black pepper. Mix to combine. Add the mixture to a greased rectangular or oval casserole dish (about 8 x 12-inches). Pop open the can of biscuits. Lay the biscuits right over top the cheesy broccoli mixture. Sprinkle with more cheese. Top each biscuit with a few turns of freshly ground pepper. 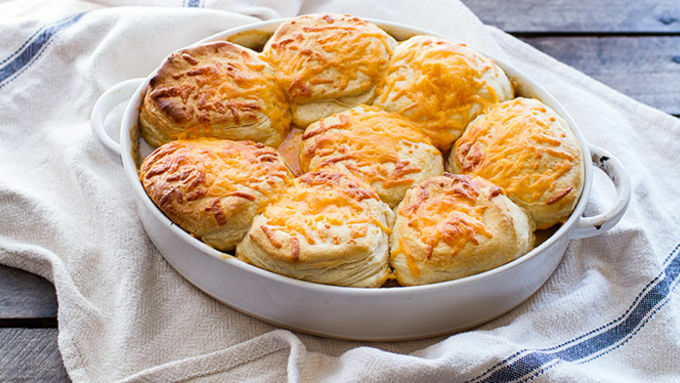 Transfer the dish to the oven and bake for 40-45 minutes, until biscuits are lightly golden brown and the center is bubbling. If the biscuits get too brown while baking, cover the dish with foil. 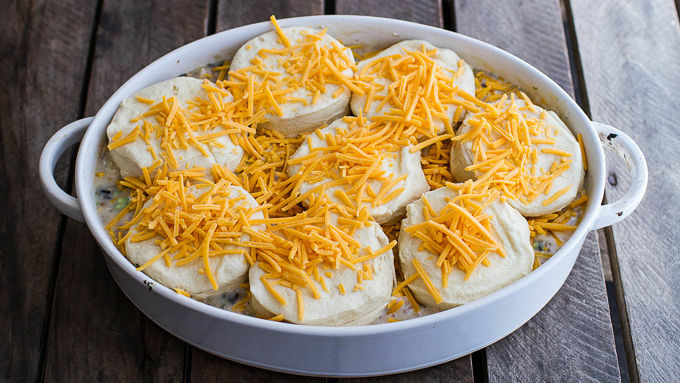 To serve, remove one of the biscuits, exposing the casserole filling. Spoon it out into a bowl and top with a biscuit. Repeat. The dish can be made up to 3 days ahead of time. Assemble the broccoli mixture, cover, and refrigerate until ready to bake. When you’re ready to bake, add the biscuits. Bake as directed above. To make this vegetarian, omit the chicken and use creamy vegetarian soups. This is what a good fall dinner looks like. 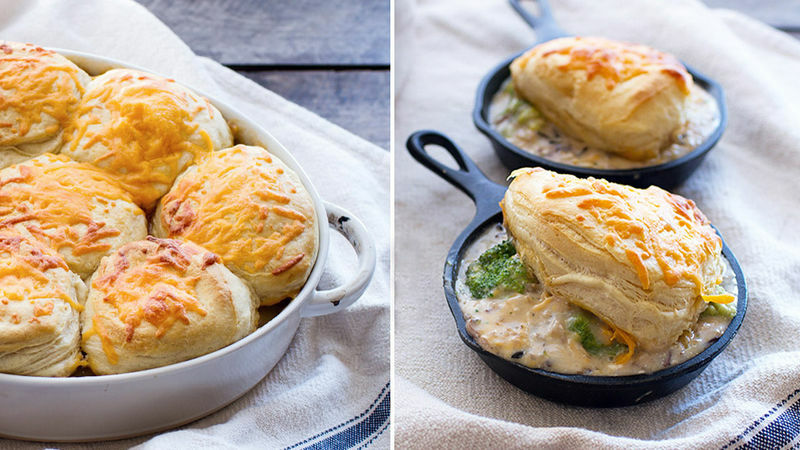 This dinner is creamy, cheesy, chicken-y and totally cozy! Just what every fall dinner should be. Not only that, this savory casserole could not be easier ... making it perfect for the busy months ahead. And yes, I'm talking Thanksgiving and of course, right on through the holidays. It’s about that time of year when things start getting crazy busy and dinner becomes a quick bowl of cereal. Which is good and all, but we can help you warm your bones with a hot, comforting dinner on a chilly night. This is that dinner, the dinner that saves all. Serve to your family, serve to guests or bring it to a party. People will devour this AND love you for making it. The good news is you won't believe how easy it is to make! The dish can be made up to 3 days ahead of time. Assemble the broccoli mixture, cover, and refrigerate until ready to bake. When you’re ready to bake, add the biscuits. Bake as directed above. To make this vegetarian, omit the chicken and use creamy vegetarian soups. Serve it up in dishes with extra cheese. Total bowls of comfort right there!